Two British language teachers who worked for Shane English School Japan filed suit Thursday against the school’s operator Shane Corporation Ltd., claiming that their dismissals were unfair and invalid. Chris Beardshall, 46, and Adam Cleeve, 44, demanded that Shane pay their monthly salaries until the day of the case’s final judgment. The two were hired on fixed-term, one-year contracts, with annual renewals possible. Beardshall said he joined Shane in 2003 and that he was dismissed as of Dec. 31, 2016, after refusing to sign a contract that included a drastic pay cut. “Shane decided to cut my salary by two-thirds … yet they know I have a wife and a child,” Beardshall said during a news conference held Thursday at the labor ministry. Cleeve, who joined the company in 2015, was dismissed as of Feb. 28, after the company determined his 24 days of absence to be unreasonable. Cleeve said he told the company in advance that he needed to take days off due to the birth of his child. Contacted by The Japan Times, a Shane spokesman declined to comment, saying the company has not yet received details. The former teachers are now technically jobless, but claim in the suit that their contracts should still be considered active. Beardshall also said that Shane refused to give him an official certificate of resignation. “This means not only are they denying me a salary, they are also denying me my unemployment insurance,” he said. 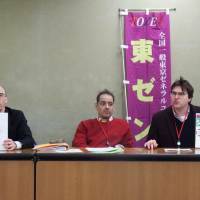 Beardshall and Cleeve are members of the Zenkoku Ippan Tokyo General Union, which has led labor strikes demanding that Shane hire all teachers on permanent contracts. 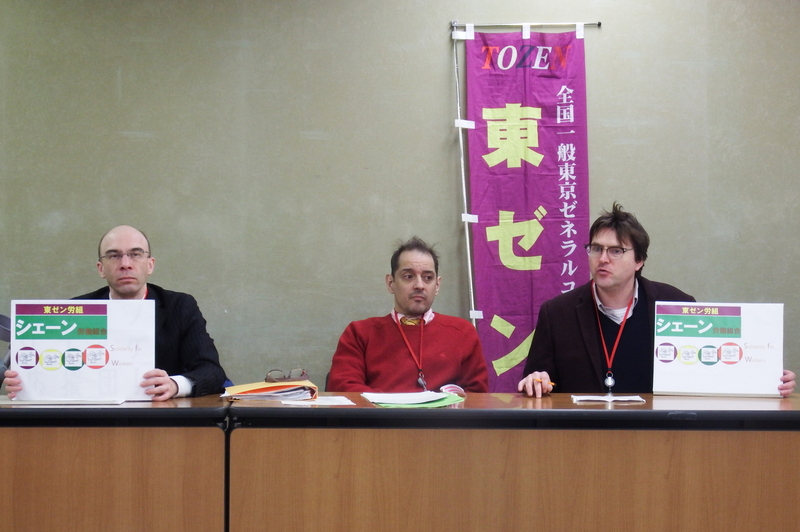 For years, non-Japanese language teachers have been fighting for job security, most of the time relating to low wages and unstable contract conditions. “Foreign teachers in language schools are suffering from horrible working conditions,” said Shoichi Ibuski, the plaintiffs’ lawyer. Ibuski said the amended law on labor contracts, which took effect in 2013, requires employers to hire workers in fixed-term contracts permanently, if requested, after they work for five years. “Because of that, cases of dismissals are occurring frequently” this month, he said.